The following table shows the schedule of 12050/Gatimaan Express including timing along with its arrival and departure time at each station with Platform number. The distance column shows the distance traveled by the train from its starting point from Hazrat Nizamuddin. 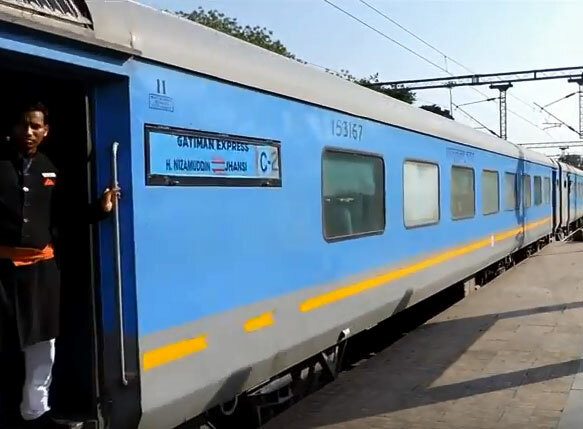 Gatimaan Express is a first semi high speed train that run between Hazrat Nizamuddin and Jhansi the fastest train in India. First run between Hazrat Nizamuddin and Agra Cantt. on 5-April-2016, has been extended to Gwalior from 19-Feb-2018. And from 1st April 2018 extended to Jhansi. It operates at a maximum speed of 160 km/h (99 mph) and is currently the fastest train in India. The train takes 265 minutes to cover the 403 km journey from Hazrat Nizamuddin to Jhansi Junction railway stations which gives the average speed of 91 km/h.